Insync is an unofficial Google Drive client which is available for Windows, Linux, and Mac OS X. The Windows and Mac version is not free, you have to pay $9.99 one-time payment, but there is 15 days free trial, so you can try it for free on your Windows or Mac. 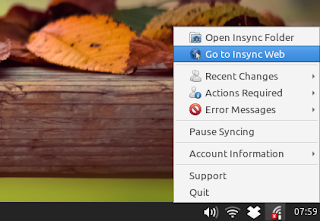 The Linux users can use Insync for free as long as it is in beta version. Insync supports major Linux distribution including their desktop environment variations. There is support for Unity, Cinnamon, GNOME Shell, KDE 4, LXDE, MATE, Openbox + fbpanel, and my favourite desktop Xfce. Today, I'd like to show you how to install Insync via its official repository so that you will get the latest version of Insync on your system. Now, you have to choose which Insync package to be installed for your Desktop environment. There are many choice which is suitable for Unity, XFCE, GNOME Shell, Cinnamon. etc. Simply type "sudo apt-get install insync-beta-" followed by Tab key to see available options.